In stock -This product will ship today if ordered within the next 2 hours and 20 minutes. 100% natural hemp extract in MCT oil. Crafted from organically grown Cannabis sativa L.
Natural infusions are created by soaking the hemp plant in any given oil. In this case, MCT (coconut) oil. The oil extracts oil-soluble compounds from the hemp plant, infusing them in the carrier oil, ready for consumption. 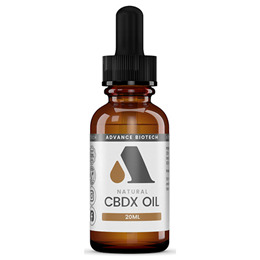 Advance Biotech is a specialist CBD producer, headquartered in the United Kingdom, with a vast experience in the manufacture and distribution of the most unique and pure hemp-based branded products within the market. With the ever-expanding knowledge of hemp-based research in the ever-changing global marketplace, they pioneer and strive to be at the forefront of this global change. Bottle size - 20ml: Approx 400 drops. Each drop has a CBD content of 0.5-1%. Recommended dosage: 3-5 drops under the tongue twice a day as a starting point and adjust accordingly. Store in a cool & dark environment. Below are reviews of Advance Biotech CBDX in MCT Oil - 20ml by bodykind customers. If you have tried this product we'd love to hear what you think so please leave a review.